Racing Hero: Dale Earnhardt - he raced as hard as he could every lap, never gave up, and just simply wanted to win, and Dale Earnhardt, Jr.
1 2001 Beatrice Speedway Cruiser A Feature win, 1 2002 Beatrice Speedway Factory Stock A Feature win, tied for 10th place in 2002 Points, 2002 Factory Stock Rookie of the Year Award, 2002 Most Improved Driver Award, 1 2003 Beatrice Speedway A Feature win and 6th in Points, 11th in 2004 Points, 7th in 2005 Points, 1 2006 Beatrice Speedway Factory Stock A Feature win and 6th in Points, 14th in 2007 Points. I was a spectator for ten years when a friend at work brought his Cruiser in. It looked like fun and was cheap to build and race. We started with an 81 Caprice with a stock 305. We then used a 350, and blew motor, after motor, after motor. Finally after two years, we started to get some seat time with the engines holding together. We built a 77 Pontiac for 2001. We had a lot of fun with it and won a lot of consi races and had several Top 10 finishes with it. We got claimed when we won our first race ever. We bought a 76 Monte Carlo and moved up to Factory Stock in 2002. We purchased an 85 Buick Regal for 2007. We have taken a break from racing since 2008 and hope to be back on the track in the near future! Get a lot of seat time, have FUN, win races, and just one Championship would be cool to have. We chose number 03 because we pitted with two other cars and their numbers were 01 & 02. We were the third car of that group. And also because of my favorite driver, Dale Earnhardt. 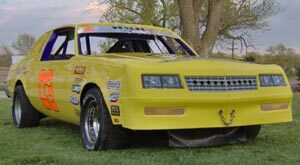 One time when we went to Thayer County Speedway to race, we loaded three cars on a flatbed trailer pulled by a Peterbuilt. That was fun! We painted some silver on our Cruiser car and the next race we won. A year later to the week we painted silver on our Factory Stock car and won again, so now we add silver to the car in July for good luck! My mom does not go to the races because she gets too nervous, so she gives me a note every week that I tape to the dashboard. We always bring the grill and cook something to eat during the races, and one night when the races were over, my dad had dumped the coals near a light pole, and a few minutes later we heard some yelling from the stands. We did not know them and thought they were yelling at someone else. Then someone from the pits noticed that the light pole was on fire, and my brother, a volunteer firefighter, grabbed the fire extinguisher and put the fire out. We now use a GAS grill! 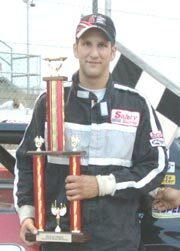 At the end of the 2004 season I finally had the chance to run at a track I have always wanted to race a Stock Car at, Eagle Raceway. That was a great time! My Grandmother had a stroke in Febuary and when she was released from the hospital she moved into Haven Manor in Lincoln. Haven Manor offers assisted living for the elderly. The manager, Marcia Matthies, and some of the residents are big race fans and some of them even had family that raced or were involved with racing in the past. We got to talking about our racing and she asked if we could display the Nebraska Stroke Foundation logo on the car. We had a logo made and installed on the car to help promote the Foundation. We took the car to Haven Manor on March 20th to show and discuss the racecar and talk about our race team.